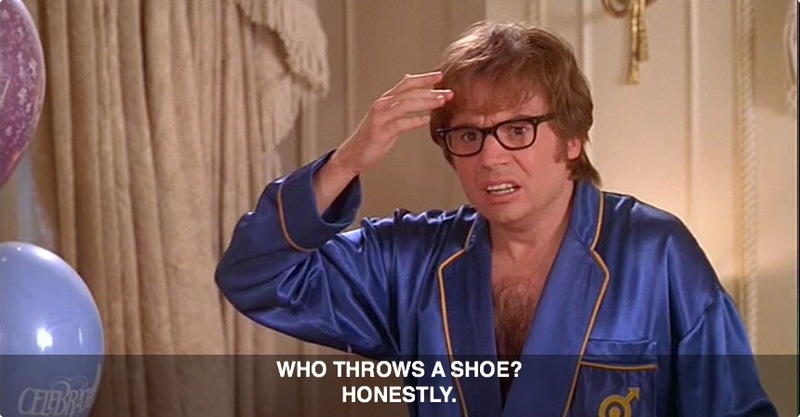 Who Throws A Shoe? Honestly. Incase anyone is wondering, this “move” is completely illegal. No way, no how this was going to end well for Shayla. Here are the outcomes of pulling a stunt like this: A.) Throwing the shoe, missing, and looking like and idiot. Or B.) You throw the shoe, hit the ball, the other team misses the shot, and you still look like an idiot. Posted on November 13, 2013, in Average Blog Posts and tagged austin powers, basketball, cooper, georgetown, shayla cooper, shoe, throws a shoe. Bookmark the permalink. Leave a comment.